EASTHAM - New Listing - Nice 3 bedroom to-be-built home on a quiet sand road, just off Schoolhouse Rd on the ocean side of Eastham. Home to include low maintenance exterior, Kohler fixtures, gas (propane) heat, Anderson windows, rear deck, tile kitchen & bath floors, landscaping (allowance) and driveway. 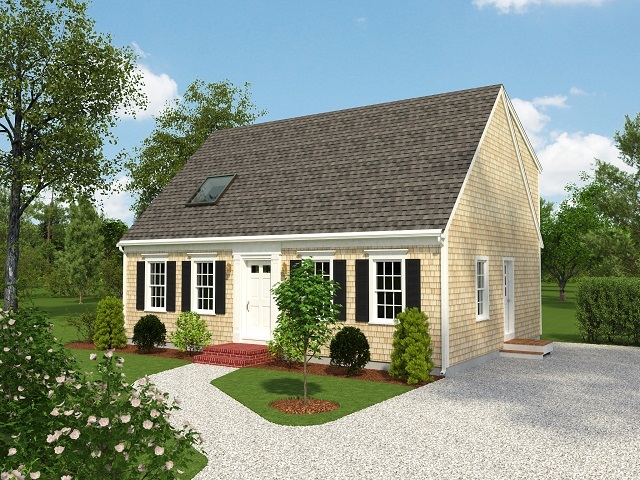 Home builder is well-regarded Cape builder, with references. The building lot is fully approved for a 3 bedroom dwelling with septic and well already installed. Listed at $441,500. Call me (or email me at BobSheldon@remax.net) for details and floorplans. Well - our 'big storm' turned out to be just about 3 inches. Here is what the Coast Guard Station looks like after a bit of the white stuff. 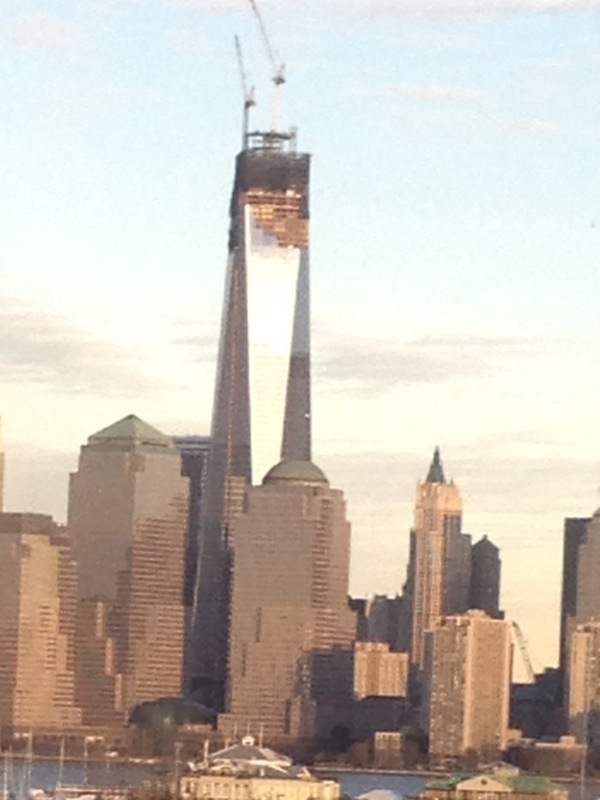 The spire on top of the Freedom Tower, in lower Manhattan, looks to be nearing completion. This will make the Freedom Tower the tallest structure in the Western Hemisphere. The photo below was taken earlier today from New Jersey by my son John. You can see that the upper floors still need their outer 'skin' and that the spire is getting taller. In just over 11 years after 9-11 we have a wonderful symbol of American courage and determination. 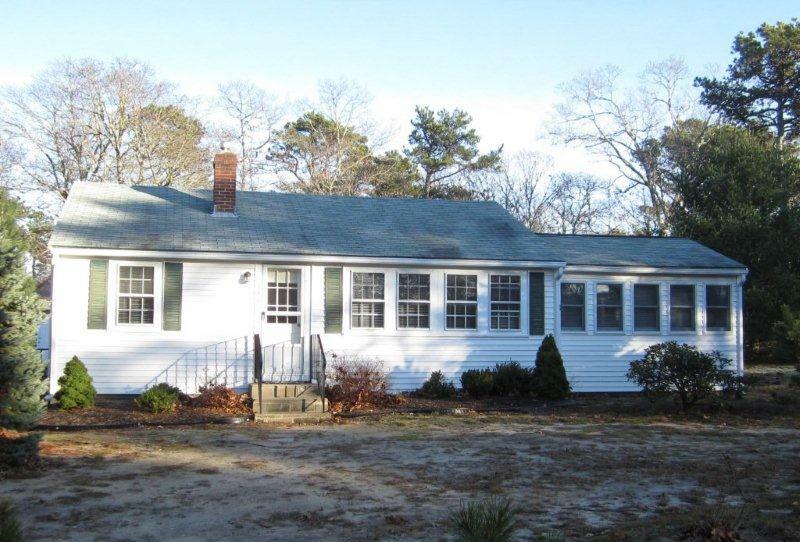 This is a cute and cozy home on a quiet sand road just a short walk to a deeded association beach on Cape Cod Bay. We have 2 enormous bedrooms, 2 baths, a living room with gas fireplace, a bright family room, a heated sun porch, kitchen, and a rear deck with a canopy. Never rented and ready for you to move in. Listed at $369,000. For more photos go to http://150ShadyLane.robertsheldon.com/. Check out a Google map. And a Virtual Tour. My 2012 Year-End Report Is Available Now! My February 2013 report is available now! This issue of my newsletter has my 2012 year-end market report for Eastham. Additionally, you'll learn about the Eastham rental home tax for 2013 and a new listing. This newsletter has been published every month for almost 10 years. My goal, with my newsletter, is to provide accurate sales and market information about the Eastham housing marketplace, to add commentary and opinion (as appropriate), and to keep it interesting. Download your copy of my February newsletter now. Sunday afternoon was a delightfully sunny, albeit a bit cold. 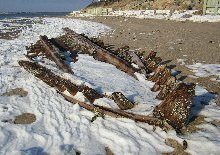 I had heard that the bones of the tugboat 'Hammer' had become exposed on the beach at Cooks Brook Beach. 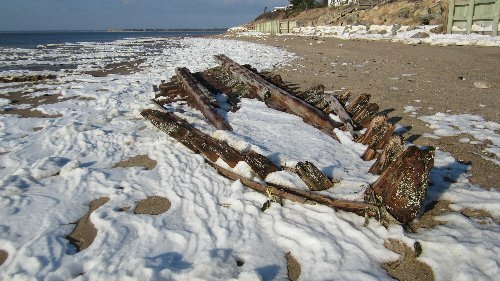 The Hammer was permanently beached in February, 1965, on the beach between Cooks Brook and South Sunken Meadow Beaches. The tugboat's remains get periodically covered and uncovered by the shifting sands. This tugboat ended in the conviction of the Tommy Dennison, the only man in Massachusetts in the 20th century to be convicted of piracy. It's an interesting story ... found here. Lastly, here is a summer photo of the Hammer. It was sad to hear that Patti Page passed away on New Year's Day. Although not her most 'famous' hit (probably 'Tennessee Waltz' or 'How Much Is That Doggie in The Window'), her singing of 'Old Cape Cod' seems to be a local favorite. I wonder why (Hmmm). Check out this YouTube video of Patti singing 'Old Cape Cod'. Eastham's December Sales - Great Month! 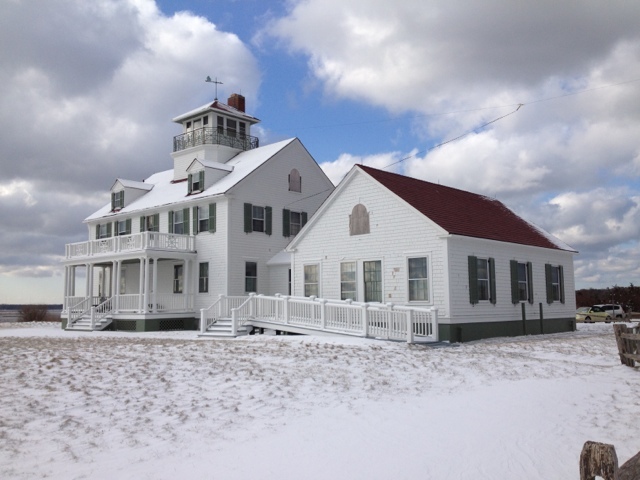 There were 19 homes sold in Eastham in December. The median sale price in December was $365K. There are currently 96 active single family listings in Eastham, with an average list price of $607K and a medium price of $457K (see chart below). The average days-on-market is currently 253 days. For more details, graphs, and commentary, download my latest monthly Eastham newsletter -- here. I've been publishing this newsletter for over 9 years with the goal of providing market information to my clients, so they may approach the market from a more informed position. Check it out!